As an artist long interested in the social and political dimensions of art, few have influenced me as much as the great Mexican artist, David Alfaro Siqueiros. Early in my career, exposure to his profound works of social realism not only inspired me to continue to pursue the path of an artist, they also convinced me that art was a force capable of changing the world. I can happily say that the works of the great master are as relevant as ever, and that his last surviving mural in the U.S. was presented to the public by the Santa Barbara Museum of Art on October 20, 2002. Along with thousands of others, I attended the unveiling ceremony for Retrato del Mexico de hoy ("Portrait of Mexico Today:1932"), which is now in the museum's permanent collection and on display in an alcove near the museum's entrance. Mexico Today mural detail: J.P. Morgan overlooks the slaughter of Mexican workers. Siqueiros grew up in a Mexico filled with turmoil and class conflict. He was a student radical and as a young man fought in the revolution. He became a committed communist and a union organizer and was repeatedly arrested for his efforts. However, the development of his political views went hand in hand with the advent of his innovative aesthetics. 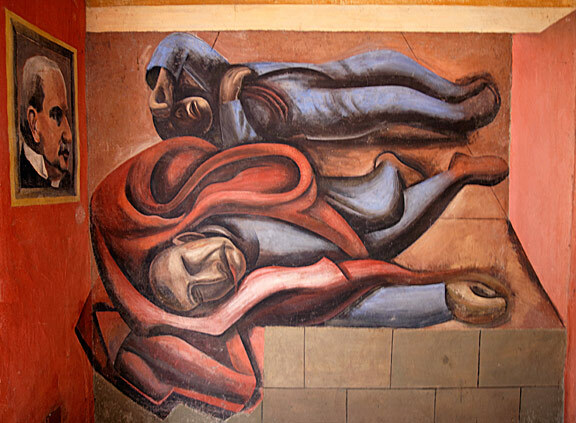 With his contemporaries Diego Rivera and José Clemente Orozco, Siqueiros put aside easel painting in favor of the democratic public mural. Despite his standing as a highly regarded artist he was eventually driven into a short exile because of his leftist ideas. Siqueiros came to Los Angeles as a political refugee in 1932. He stayed for six months before being unceremoniously deported after his visa ran out. His arrival in the U.S. came during the great depression when factories closed and thousands were thrown out of work. While in L.A. he painted three important murals. The first, Mitin Obreo ("Worker's Meeting") was created at the prestigious Chouinard School of Art. Siqueiros had been invited by the school to teach a class in mural painting, and what better way to educate his students than to directly involve them in the creation of a mural. The 20 by 30 foot painting was on an outside wall of the school. Mitin Obrero depicted a militant union organizer and the multi-cultural crowd of workers who had put down their tools to listen to his oration. The authorities almost immediately covered the painting with a tarp to prevent public viewing and within a year it was completely destroyed. The mural represented a great advancement in art making in the U.S., it was one of the first outdoor murals to create a public space on the street. It was also the very first time in the U.S. that an artist had used a projector to transfer enlarged images to a surface, or to use a mechanized spray gun to apply paint. 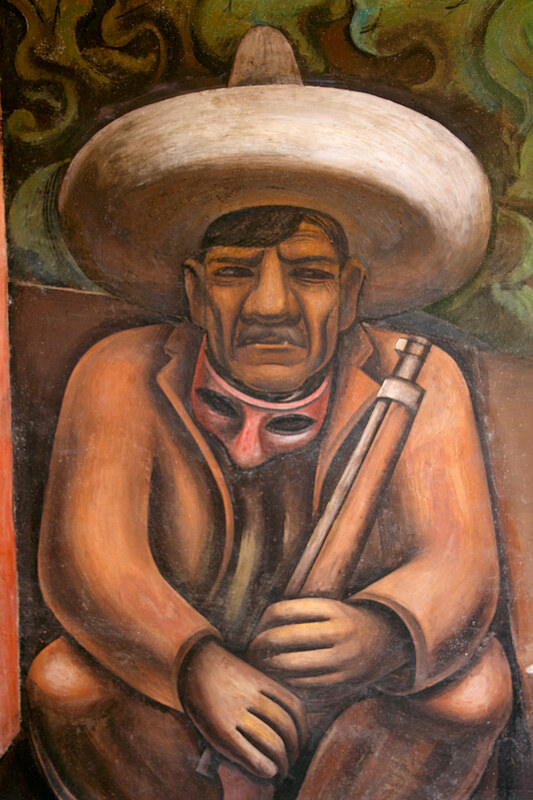 This was a technique developed by Siqueiros. 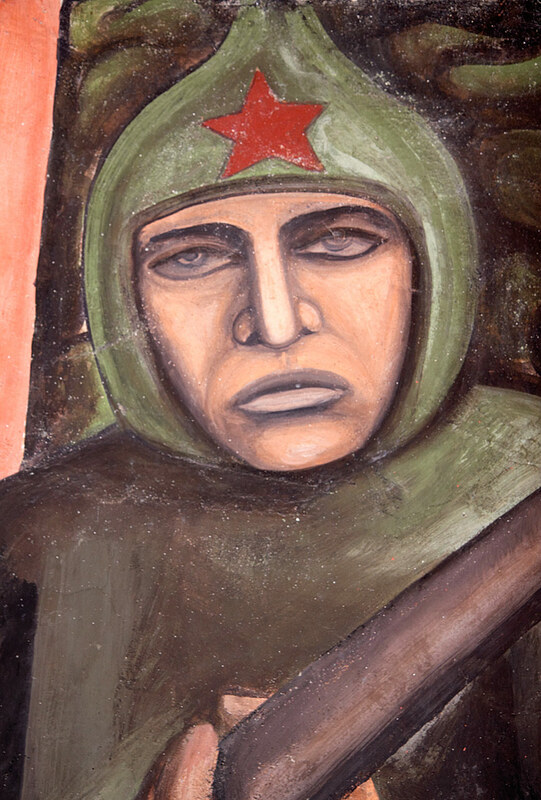 Mexico Today mural detail: Red Army soldier. The second and most famous of Siqueiros' L.A. murals, América Tropical, was painted on a rooftop overlooking the City's historic Olvera Street. The Plaza Art Center wanted the artist to paint an exotic picture of Latin America replete with tropical birds and lush jungle. Instead Siqueiros covered the 130 foot wall space with a terrifying visage. The mural's central focus was an Indian crucified on a cross, on top of which sat the eagle of imperialism. The background consisted of ruined Indian pyramids, a reference to the European sacking of indigenous grandeur. To the left and right of this scene, armed peasants were coming out of the jungle to wage a war of liberation. Once again Siqueiros used a projector to transfer his images to the wall, and a spray gun to paint the mural. Needless to say, conservatives were outraged over the artwork and authorities had it immediately whitewashed. It sat abandoned for decades until the J. Paul Getty Museum decided to restore it. The artist's third mural in Los Angeles, Portrait of Mexico Today: 1932, had better luck. Film director Dudley Murphy was a great supporter of Siqueiros, and to show his appreciation the artist painted a mural at the director's Pacific Palisades home. Luckily for us all, the 170 square foot work was donated to the Santa Barbara Museum of Art in 2001. 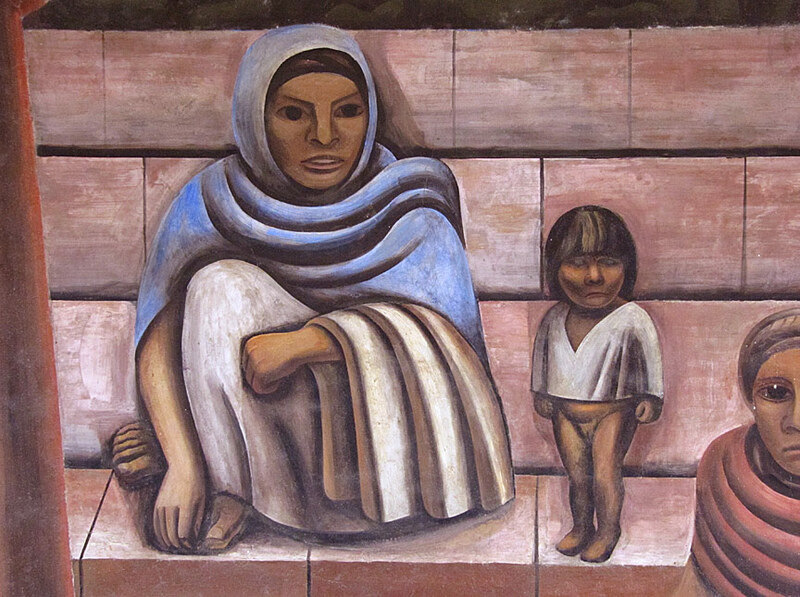 Situated in a semi-enclosed garden structure, the mural depicts two impoverished peasant women with a partially clothed child standing between them. The trio are placed on the steps of an ancient Indian pyramid surrounded by jungle. To the extreme left of this scene are the bodies of two slain workers, blood trickling from their mouths. Overlooking the slaughter is a portrait of the American capitalist, J.P. Morgan. 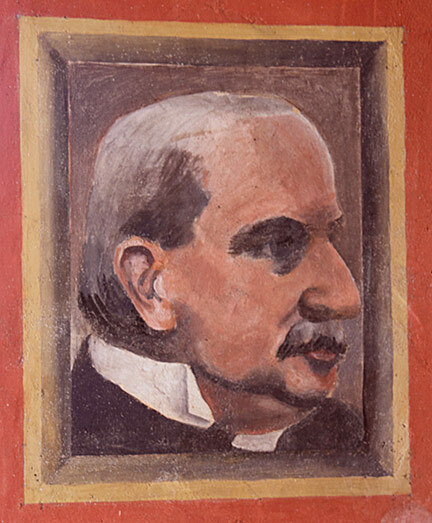 Close by and under the gaze of the approving Morgan, sits the Mexican President, Plutarco Elías Calles. Shown as an armed bandit with stolen money bags at his feet, Calles is portrayed as an errand boy to the foreign masters of El Norte. 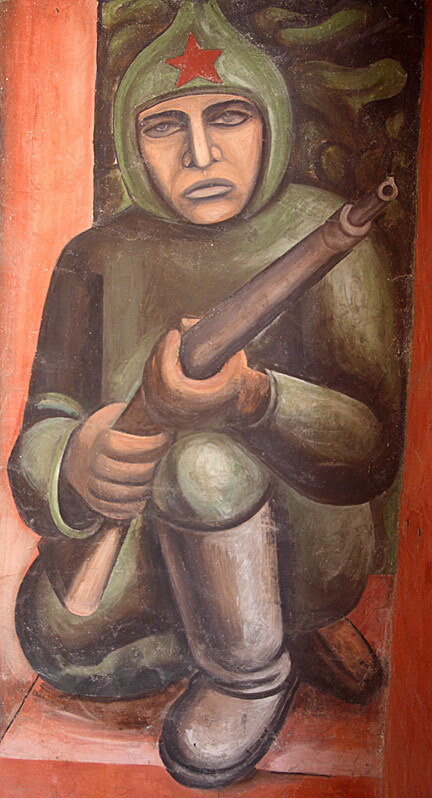 At the opposite end of the mural crouches a communist soldier bearing a rifle, representing the forces that would forever end the oppression of the workers; the soldier bears a striking resemblance to Siqueiros. Siqueiros passed away in 1974, never having achieved the recognition in the U.S. that he so richly deserved, until the Santa Barbara Museum of Art honored him with a community celebration. October 20th, 2002 was a milestone for freedom of expression, but it was also a great day for art and a vindication for those artists whose works reflect a social consciousness. While dozens of luminaries from the world of art, commerce, and politics were part of the ceremony (including the Mayor of the city of Santa Barbara and a representative from the Mexican government), it was the thousands of ordinary people who attended the unveiling that served as the highest tribute to the revolutionary artist. 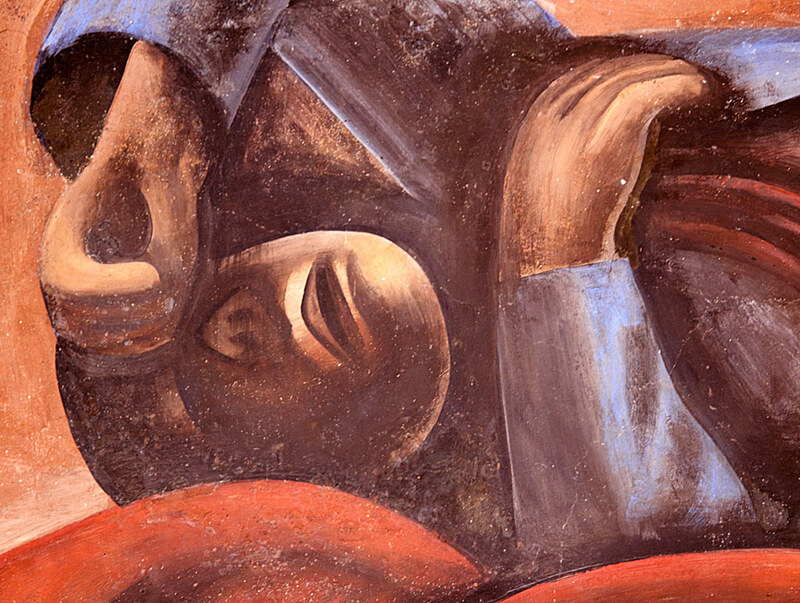 People thirst for art that reflects their reality, history, and aspirations, and today's artists must rediscover the path blazed by David Alfaro Siqueiros. Philip Stein, a.k.a. Estaño, wrote the definitive biography on Siquieros, Siqueiros, His Life and Works. Estaño (1919-2009) was a tremendously talented painter who worked with Siquieros in Mexico for some ten years, helping the master to create some of his most renowned murals. The 400 page book provides incredible insights into the work, life, and times of one of the world's greatest political artists. The book includes 72 pages of color and black and white artwork reproductions, as well as historic photographs.